Barren landscape with Carn Enoch, Garn Fawr and Y Bryn outcrops. Not quite as high as Carningli Mountain to the East, Mynydd Dinas has quite a few hidden surprises. From Dinas take the road sign marked 'Spring Hill' and follow it past the houses and onwards up the now country lane, you will round a hairpin bend and continue onwards up the hill and over a cattle grid. The landscape will open up on both sides and on your right you will see Carn Enoch in the distance. Follow the lane until you see a small grassy car parking area on your right, park there. We'll start with Carn Enoch as this is the nearest to where you are parked. 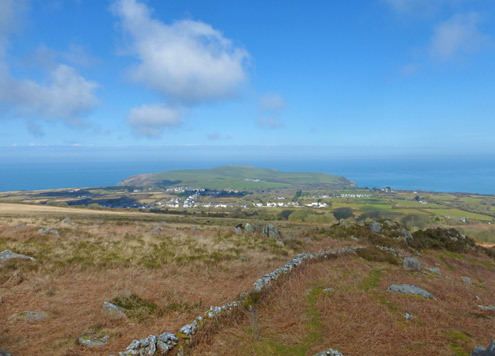 Follow one of the many grassy paths in the general direction of Carn Enoch to enjoy splendid views over Dinas Island and the Bays of Fishguard and Newport. It's not just the views from Carn Enoch that are surprising, if you look around the rocks for long enough you may come across a few that have very strange markings that look like they've been carved into the cracks in the rocks. We have no idea how they came about. 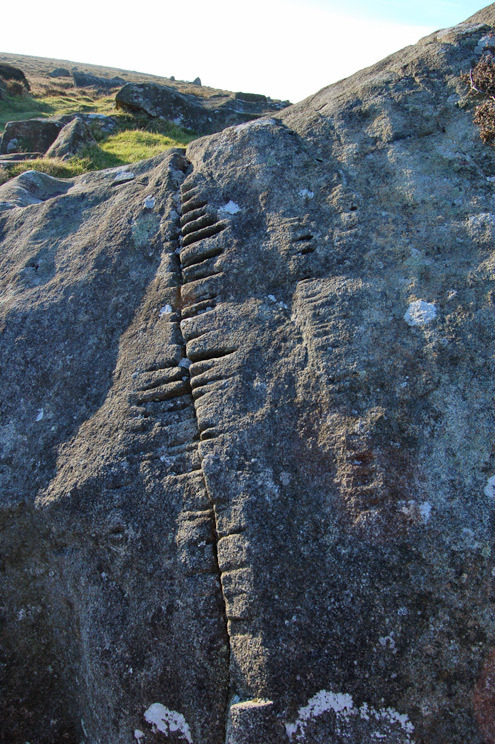 The carvings can be found on a few slabs to the south east of Carn Enoch, they are park of the lower rocky out crops. 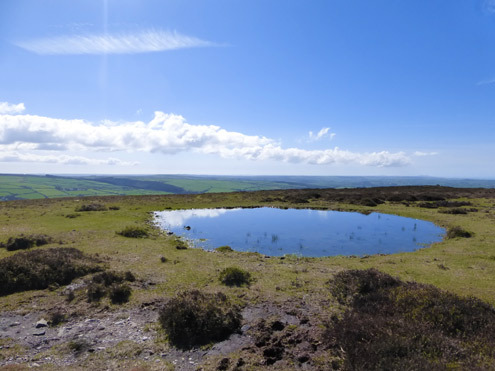 From Carn Enoch continue walking in a westerly direction over the summit of Mynydd Dinas (where this is a lovely mountain pond) you will discover Garn Fawr, and if you've driven from Fishguard this is the outcrop you can see as you come down hill into Dinas Cross. 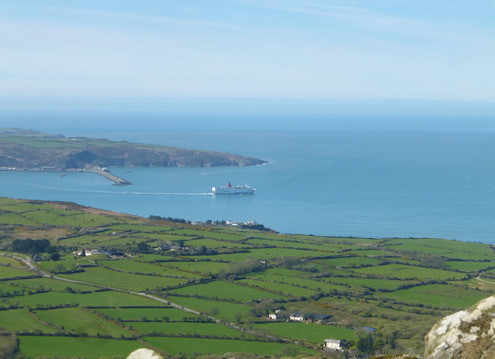 The views from Garn Fawr over Fishguard Bay are second to none, and if you're there whilst the ferry is coming or going then even better. A word of warning if you do decide to climb up Garn Fawr, there's quite a large vertical drop on it's northerly side. From Garn Fawr you can walk in a southerly direction and pick up quite a wide grassy track. This will take you in a more circular walk around Mynydd Dinas and brings you back nearby to where you had parked. There are a few smaller rocky outcrops along this route. The last outcrop on Mynydd Dinas takes you back down towards Dinas Cross. Park at the view point which has splendid views over Dinas Cross and cross over the lane - you will see a path heading east through the gorse and bracken. Follow this for approximately half a mile and cross over the farm track to continue onwards to Y Bryn. Go over the stile and you are now just below the rocky outcrop. To get to the top, walk around it's left hand side past the old enclosure with a small overgrown pond in it. 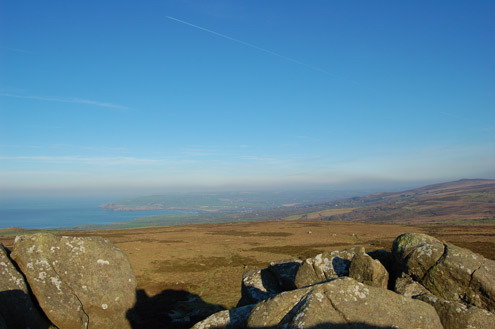 Fine views over the beautiful countryside can be enjoyed from the peak of Y Bryn. 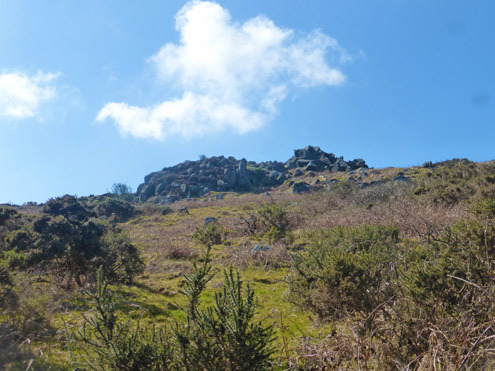 From Y Bryn you can follow a path that leads all the way to Newport via the lower slopes of carningli Mountain. Map showing location of Mynydd Dinas at Dinas Cross.